And he customizes the gift to what we need. Two lessons here. Santa isn’t focused on what he gets but, rather, what he can do for others. He also takes the time to do the research and get to know our needs, wants and desires in order to customize what he gives. 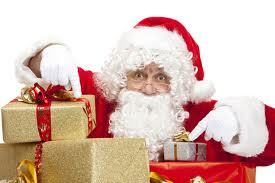 Santa knows everyone’s name, everyone’s birthday, favorite food, hobbies and colors. Oh, yes; Santa also knows if we have been bad or good. Have you ever met someone at an event, promised to email her/him an article by email, offer to call, or connect her/him to another connection – but didn’t? Yes; life gets busy but we can learn from Santa, who always follows through. If Tony wants a bicycle, that’s what he gets, not a sled. And Tony knows he can count on getting that bike by December 25. Santa is a man of his word and consistently follows through. Thank goodness for Santa. He has been around a long time, through economic booms and economic recessions. In the recent lean years, Santa was still there. Maybe the gifts weren’t as many or as expensive but his message of Generosity still made the season bright. You have heard it before but it needs repeating: you are your brand by your actions and your words. What is your one-word Brand? When you leave the holiday event, after talking to either one or one hundred people, you will have left your brand with them. Be sure it is the brand you intend. Everything you say and do will result in an impression you leave with people. Care about them, show an authentic interest in their concerns, providing solutions to their problems or helping in any way will result in a brand of trust and trust is the foundation of all effective and lasting relationships. So whether you are representing yourself, a service or a product, the more trust you build, the more likely you will be able to succeed. You don’t believe in Santa? You stopped believing decades ago? I’d recommend you re-think that one. Next time you are at the shopping mall, check out the longest line. Chances are it will be the one leading up to the rosy cheeked gentleman, in the red velvet suit, grinning from ear to ear and shouting “Ho, Ho, Ho”. I am a CAREER NUT! It’s my passion! I have spent over 25 years as a Human Resources leader for Fortune 200 companies. I’ve made selection and promotion decisions as well as coached professionals to their career success. I’d love to discuss your career success.